Which teams are Final Four-bound? We asked our writers to peer into their crystal ball and predict how the 2018–19 college basketball season will go. The start of the 2018–19 college basketball season is less than a week away, and what happens next is anyone's guess. Still, we asked a panel of six writers to gaze into the crystal ball and make his or her picks for the Final Four, national champ, player of the year, breakthrough team, overrated team and more, and the results reflect the wide-open feeling heading into this year. Nine different teams received votes to make the final weekend, and there were four different picks for national champion. The familiar blue bloods are all expected to be contenders again, but less traditional faces like Tennessee, Nevada and Kansas State are ready to shake up the national picture. 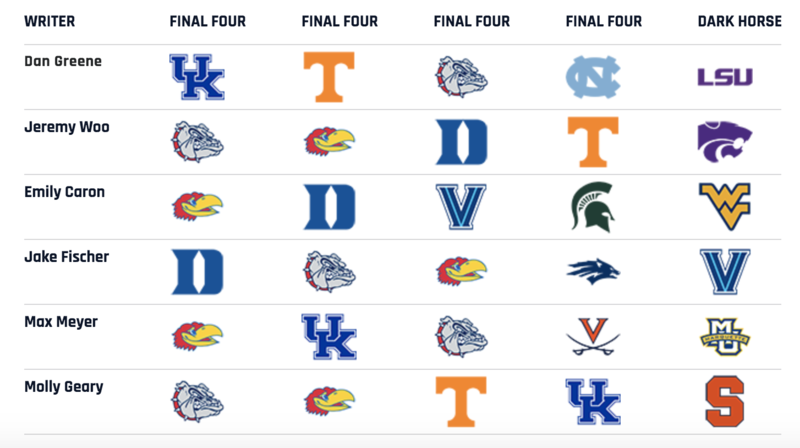 Our Final Four and darkhorse picks are below, followed by predictions for a number of other categories across the sport. Dan Greene: Kentucky. Coach K may have brought this year’s most NBA-buzzworthy freshman class to Durham, but what John Calipari has in Lexington is a team that could win it all on this level. It’s a blend of very talented freshmen (three of the consensus top 15, plus two more in the top 35), last year’s very talented freshmen who are now sophomores (most notably forward PJ Washington), and the rare impact veteran (forward Reid Travis, a grad transfer from Stanford and two-time All-Pac-12 first-teamer). It’s the sort of mix that has previously resulted in an undefeated run to the Final Four (in 2015) and a national title (in 2012). That bodes well for the Wildcats' chances at the latter. Jeremy Woo: Gonzaga. Of the elite teams, the Zags have the most appealing mixture of experience, talent and continuity. This team went to the championship game two years ago (when most of its key players were underclassmen), endured a difficult upset loss in last season’s Sweet 16, and could be on the precipice of a breakthrough. Any or all of Killian Tillie, Rui Hachimura and Zach Norvell could take major steps forward [Editor's note: Killie was announced Tuesday night to be out eight weeks with a stress fracture]. Transfer Brandon Clarke is a person of interest and will help replace the departed Johnathan Williams. A handful of talented underclassmen will to fill out the rotation. The key will likely be senior Josh Perkins, who has shown the talent, if not the consistency, to lead Gonzaga deep into March. Most of the other serious preseason contenders will have to mesh new parts together, and few of them return tested decision-makers in the backcourt. Mark Few’s teams have been inching closer to glory, and this feels like it could be the year. Jake Fischer: Gonzaga. The Bulldogs are simply loaded, experienced, talented and loooong. Head coach Mark Few will have more than an ample opportunity to avenge the Zags' 2017 title loss with this year's group. Star-studded freshmen classes aside, it will be tough for any program to counter a stud senior point guard in Josh Perkins, a ridiculously athletic frontcourt tandem in Rui Hachimura and Killian Tillie and complementary outside threat Zach Norvell—on both sides of the floor. Emily Caron: Duke. There’s not a whole lot teams are going to be able to do to stop Duke’s stacked team this season—aside from match its production, which is much easier said than done. The Blue Devils' freshman class brings in unmatched talent in R.J. Barrett, Cam Reddish, Zion Williamson, Tre Jones and four-star Joey Baker. Jones is a fabulous facilitator who will be surrounded by unstoppable scorers. While things could look a little messy on the defensive end with such a young team, it’s still going to be hard for even the country’s best competitors to contain Duke, even if Duke can’t contain them. Max Meyer: Kansas has a NPOY contender (Dedric Lawson) and a potential one-and-done star that could end up as a top-10 pick in the upcoming NBA draft (Quentin Grimes). The Jayhawks’ bench unit alone could probably make the NCAA tournament. Key contributors from last year’s Final Four squad Udoka Azubuike and Lagerald Vick are back. This team is absolutely loaded with very few holes, so I’ll roll with Bill Self’s squad to cut down the nets. Molly Geary: Gonzaga. I was pretty high on the Zags going into last March, and while it didn’t quite pan out I think they're even better this year. Rui Hachimura appears poised to explode on the national scene and Zach Norvell could break out as well after averaging 12.7 points and shooting 37.0% from three as a freshman. The Bulldogs are flat-out efficient, with almost all of their notable returning players (a group that also includes Killian Tillie, Josh Perkins and Corey Kispert) having posted an offensive rating of at least 119.0, per kenpom.com. They have a senior point guard in Perkins and added a pair of underrated transfers in big man Brandon Clarke and guard Geno Crandall, the latter of whom shot 41.7% from three last year. And despite playing in the weaker WCC, Gonzaga will be plenty battle tested thanks to a non-conference slate that includes North Carolina (in Chapel Hill), Washington and Tennessee. Greene: Marquette. Steve Wojciechowski’s Golden Eagles have reached just one NCAA tournament in his four seasons at the helm, a one-and-done appearance as a No. 10 seed in 2017. Their offense, led by guard Markus Howard (45.4% from three for his career), has ranked among the 12 most-efficient the last two seasons, but their defense has been their demise. This year four starters return from an NIT quarterfinalist; between some maturation and the addition of two good defenders via transfer (6’ 3” guard Joseph Chartouny from Fordham, and 6’ 7” forward Ed Morrow from Nebraska), Marquette seems primed for some overdue improvement on that end of the floor. That would help the Golden Eagles, well, break through into national relevance again. Woo: Washington. Continuing in my newfound role as Pacific northwest hypeman: the Huskies have a sneaky chance to win the Pac-12 in Mike Hopkins’s second season in Seattle. After winning a surprising 21 games last year and buying into the 2–3 zone Hopkins imported from Syracuse, Washington gets everyone back and rolls out a balanced rotation led by high-scoring guard Jaylen Nowell, reigning Pac-12 defensive player of the year Matisse Thybulle and post-up threat Noah Dickerson. This was already a staunch defensive unit, and another year together should produce gains on both sides of the ball. With the conference’s traditional powers all retooling, there’s ripe opportunity for the Huskies to take a leap this season. Fischer: Mississippi State. After reaching the NIT semifinals last season, head coach Ben Howland returns an experienced, battle-tested squad that should be primed for the Big Dance. The Bulldogs haven’t appeared in the NCAA tournament since 2009. Talented brothers Quinndary and Nick Weatherspoon appear set to start alongside one another. Big man Aric Holman is another year older and stronger. Howland’s team boasted the 40th-stoutest defense in the country a season ago, per kenpom.com. Should Mississippi State remain pesky on that side of the floor, its expected offensive growth (the team collectively shot a horrendous 31.9%) could have the Bulldogs as a sneaky Sweet 16 team. Caron: Nebraska. The Cornhuskers could really do it this year. Nebraska showed notable improvements last season, notching 13 wins in the Big Ten in a 22-win season. They return a trio of talented seniors in James Palmer Jr, Isaac Copeland Jr. and Glynn Watson Jr., while an improved Isaiah Roby returns as well to complete Nebraska’s top-four leading scorers. If a few of the younger guys can step up for the Cornhuskers, Nebraska should be a sure NCAA tournament team. It's got proven defensive prowess, offensive potential and excellent experienced players to lead the charge. Meyer: LSU. Tremont Waters was one of the best point guards in the country last season … as a true freshman. He averaged 15.9 points, 6.0 assists and 2.0 steals per game, and his performance expedited the transition process in Baton Rouge under Will Wade. LSU also brings in two highly regarded recruits in Naz Reid and Emmitt Williams. In what figures to be a strong SEC overall, the Tigers have the talent to make a surprise run close to the top. Geary: Washington. Having a year of playing in Mike Hopkins's 2–3 zone under their belt will only help the Huskies defensively, and Matisse Thybulle is quietly one of the nation's best defenders. Jaylen Nowell had an extremely impressive freshman year and could take his game to the next level if he improves his three-point shot (35.1%) a bit, and Noah Dickerson is back to man the paint as a senior after a 15.5 ppg, 8.4 rpg season. Not to read too much into an October exhibition, but Washington had its way in the second half with a preseason top-10 Nevada team, and that was without Dickerson available. If the Huskies' offense shows up this year more often than not, they'll make plenty of noise. Which Major Conference Teams Could End NCAA Tournament Droughts? Greene: Purdue. Matt Painter is a good coach. Carsen Edwards is among the country’s best players. But I’m pumping the brakes on these Boilermakers being among the country’s 25 best teams. As brilliant a scorer and playmaker as Edwards is, Purdue is going to miss the stellar four-man senior class that filled the rest of last season’s lineup, and the most proven player among their replacements is Evan Boudreaux, who starred at Dartmouth but is making a leap from the Ivy League to the Big Ten. In a conference that doesn’t look to be very forgiving, I’ll wait and see with the Boilers. Woo: Michigan State. I get that the Big Ten is fairly shallow again, but I’m not rushing to crown the Spartans in any way, shape of form. It’s always easy to default into the conclusion that a Tom Izzo-coached team will end up in good shape, but remember that 1) this team was prone to serious fits of offensive impotence last season, 2) their two best players were NBA lottery picks and 3) there’s probably an unfair amount of responsibility now riding on Cassius Winston. The junior guard is one of college basketball’s more experienced playmakers now, but isn’t an explosive shot creator. Nick Ward has been in and out of the doghouse and may not be a consistent go-to option in the post. Big Ten games have a tendency to bog down and hinge on late-game execution, and I wonder if the Spartans will be again plagued by an inability to conjure up big points when they need them. They should be a tournament team again, but that may be it. Fischer: Kentucky. Yes, John Calipari has one of his deeper teams in Wildcats history, but I'm skeptical of just how talented this UK squad is in reality. On paper, the Wildcats may be the top team in the land. You won't find many bigger PJ Washington fans than myself. Reid Travis is a huge transfer add from Stanford. But Nick Richards and Quade Green struggled mightily with consistency a year ago while Keldon Johnson and Tyler Herro are far from Kentucky's top freshmen class during the Calipari era. This is a preseason top-five team, for sure. But I'm skeptical we'll see them advance past the Sweet 16. Caron: Tennessee. Despite bringing back its entire roster from last season’s No. 3 NCAA seed and SEC regular-season co-champion team, Tennessee still looked limited. The Vols couldn’t make it past the second round of March Madness, and I’m skeptical of what coach Rick Barnes can continue to do with less talent than many of the other SEC contenders (reigning SEC player of the year Grant Williams notwithstanding). Considering the strength of teams like Kentucky, Auburn, and even Mississippi State and LSU, there’s too much depth and too many tough contenders for me to have confidence in Tennessee’s No. 5 SI preseason ranking. Meyer: Oregon should be considered a favorite to win the Pac-12, but I don’t envision this Ducks team making it out of the first weekend in the NCAA tournament. Bol Bol and Louis King are two electrifying freshmen, and Payton Pritchard is a steady point guard. But can the Ducks generate enough offensive firepower? I don’t think so, and I think there will be an adjustment period for all these new pieces gelling. Geary: Purdue. Not only did the Boilermakers lose four starters, but all of them were seniors who spent four years playing together in Matt Painter's system. Losing that abundance of experience makes it incredibly difficult to have an even semi-seamless transition, even if you are led by a player as excellent as Carsen Edwards. I think the Boilermakers certainly have the potential to earn their top-25 preseason ranking, primarily if Nojel Eastern proves ready to step up and transfer Evan Boudreaux adapts well with the rigors of the Big Ten, but everyone outside Edwards is going to be adjusting to a new role (and even he will be impacted by his supporting cast changing), and that likely means growing pains—especially early on. Greene: Marshall. Not only will the Thundering Herd be good, but they’re the team to watch because of how they’ll be good: by playing at one of the country’s fastest paces and having quick triggers from beyond the arc. Coach Dan D’Antoni—brother of Rockets coach Mike, hence that familiar-sounding playing style—brings back four starters from a team that upset Wichita State as a No. 13 seed in March, including star guard Jon Elmore (22.7 ppg, 6.8 apg, 5.8 rpg last season). Also, Marshall was snubbed from our recent uniform rankings. Woo: Western Kentucky. The Hilltoppers boast a serious mix of talent this season, and it’s more than just blue-chip freshman center Charles Bassey—double-digit scoring guards Taveion Hollingsworth and Lamonte Bearden are back, and 6’6” sophomore Josh Anderson has pro potential and should take a step forward on the wing. Grad transfer Desean Murray played a role for Auburn last year and averaged 20 per game at Presbyterian in 2015–16. There’s also some NBA buzz surrounding another true freshman: 6’7” point guard Dalano Banton. The talent has to gel quickly, but it’ll be no shock to see Western Kentucky contend in Conference-USA and make a run late in the season. The runway looks clear, at minimum. Fischer: Northeastern. This is admittedly a homer pick (full disclosure, this writer is a proud Husky alum), however Bill Coen's club was recently tabbed as the CAA's preseason favorite, boasting an arguable conference Player of the Year candidate in senior point guard Vasa Pusicia, last year's Defensive Player of the Year in Shawn Occeus and a deep rotation of long, versatile wings that can snipe from outside. Toss in senior big man Anthony Green, and Northeastern has the recipe to play bracket-buster in March. Caron: Loyola-Chicago. Sister Jean and the Ramblers made it to the Final Four last March as an underdog mid-major. While Loyola-Chicago did lose two starters from last year’s storybook Cinderella team, they also return three of their best players. With Clayton Custer, a gifted guard, and Marques Towns—the team’s top-two scorers—running the backcourt and big man Cameron Krutwig, who’s poised for a breakout season, the Ramblers could repeat as a surprise team come this spring. Meyer: Davidson. Kellen Grady averaged 18 points in his freshman season at Davidson, and is ready to be the focal point of the team with Peyton Aldridge gone. Grady and Jon Axel Gudmundsson make up a lethal backcourt, and the Wildcats have quite a few strong shooters littered across the roster. There are questions regarding the frontcourt’s depth, but with the amount of perimeter scoring this team has, Davidson should be considered the frontrunner in the A-10 and has the makeup of a potential No. 12 seed that no tournament team would want to face in the first weekend. Greene: Rui Hachimura. Is it too much of a copout to pick the breakout everyone sees coming? The development of Hachimura’s talents over his two years since going to Gonzaga from Japan was evident in last year’s 25-points-in-25-minutes second-round showing against Ohio State, but perhaps just as importantly, Hachimura has a chance to break out as one of the country’s most popular players. He’s got the frame and game of an NBA lottery pick, plays for a highly visible program whose mid-major past still eases public embrace, is simply fun to watch, and—with apologies to Yuta Watanabe—has a chance to be the first college basketball star from Japan. There’s a lot there to capture the public imagination. Woo: Jarrett Culver, Texas Tech. The Red Raiders returned to relevance in a big way last season, and Culver is poised to take the mantle from Keenan Evans as the go-to guy. He’ll make a strong case for the NBA draft in the process. His size in the backcourt makes him a difficult mark, and he was a high-level spot-up scorer last season as a true freshman. Culver will assume a heavier load and more opportunities to create with the ball in his hands, given Texas Tech will need him to be a primary scorer. His all-around skill set and presumably large share of the offense shape up nicely, and will be pivotal as his team searches for ways to overachieve in conference play. Fischer: Daejon Davis, Stanford. Davis was the first Cardinal in six years to earn All-Freshman Pac-12 honors while setting the Stanford rookie assist record. At 6' 3" with a sizable wingspan, that's not much Davis can't do on the court, posting 10.7 points, 4.4 rebounds and 4.8 assists a year ago while shooting 40.3% from three. If Davis trims his turnovers (4.0 per game), there's nothing standing in the way of him claiming the reigns of this program, and perhaps emerging as one of the best floor generals in the country. Caron: De’Andre Hunter, Virginia. 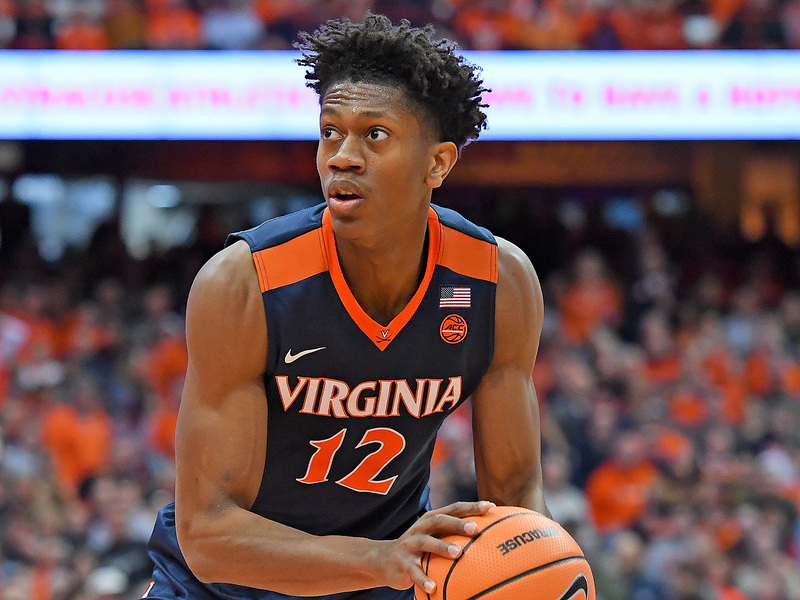 The redshirt sophomore small forward had a stellar season as a sixth man for Virginia, who finished as ACC regular season and tournament champions and earned a No. 1 overall seed to the NCAA tournament (we all know how that ended). Hunter missed March Madness with a wrist injury, but with the departure of veterans Devon Hall and Isaiah Wilkins, Hunter is set to move into a starting role. The added minutes and responsibility coupled with his impressive development throughout the season have set him up for a standout season on another talented Tony Bennett team. Meyer: De'Andre Hunter, Virginia. His absence wasn’t the only reason why Virginia became the first No. 1 seed to lose to a No. 16 seed in NCAA men’s tournament history, but it was a big one. As a freshman, he averaged 9.2 points per game on 48.8% shooting from the field. The forward suffered a broken wrist before March Madness, cutting his season short. Hunter won’t put up video-game numbers in Tony Bennett’s system, but he is a legit NBA talent and his progression as a sophomore will be instrumental to Virginia’s title hopes. Geary: Myles Powell, Seton Hall. It may seem weird to tab a player who averaged 15.5 points last year as a breakout pick, but Powell flew under the radar as the lone non-senior starter on an experienced Seton Hall squad. The rest of that core is gone, including leading scorer and go-to option Desi Rodriguez, leaving Powell as the one to step up and take over the team. I think he’s going to have a big, big year for the Pirates and be one of the best players in the Big East. He already improved his outside shooting and effective field goal percentage from freshman to sophomore year and could see another bump after a summer of work, though he’ll obviously be the focal point for opposing defenses now. Greene: Kansas’s streak of at least sharing the Big 12 title ends. It has to happen sometime. And while this season doesn’t seem set up for it to happen—the Jayhawks are SI's preseason No. 1, and none of their conference colleagues are ranked in the top 10—well, that’s what makes it bold. With the program’s continued implication in the FBI probe via testimony linking it to alleged payments to recruits and the fact that Kansas State has a strong senior led-lineup, there might be enough out of sorts in Lawrence for the Wildcats or West Virginia’s daunting frontcourt or even Jamie Dixon’s ascendant TCU to make a run at the crown. Woo: Loyola-Chicago gets back to the tournament’s second weekend. Why not? The Final Four may be a big ask, but the Ramblers bring back several key players led by Clayton Custer and have the firepower and purpose to win the Missouri Valley at minimum. This is a program built with the intent to stick around. Factor in a dearth of convincing mid-tier high major programs, and Porter Moser’s group may well end up positioned to play spoiler once again. It’ll just be less surprising this time. Fischer: The NCAA adopts the Olympic model. This won't happen, but the prompt is at least an ample space to make the case. We've recently experienced a weeks-long federal criminal trial that followed a years-long federal undercover investigation that has cost millions of taxpayer dollars only to prove a bunch of apparel companies, college coaches, agents and financial managers are guilty of providing money to kids who aren't paid for their services while their schools and the NCAA generates millions in revenue. The simple fix: Adopt the Olympic model, allowing players to earn non-basketball-related income. If players can sign with agents and ink endorsement deals with local business and national brands alike, it will eliminate the need for schools and agencies to pay for these kids' commitments all together, while the NCAA and schools will still turn massive profits off not paying student-athletes themselves and rolling in myriad funds from corporate sponsorships and broadcast rights. It will still be valuable, let's say, for Nike to have its swoosh on a Duke jersey, even if Zion Williamson has already signed with Puma. Caron: Memphis returns to the NCAA tournament for the first time since 2014. After a five-year hiatus, Penny Hardaway could be what the Tigers need to return to March Madness. They’ve got tons of young talent in freshman Antwann Jones, Tyler Harris and Alex Lomax and could easily surprise the AAC. Meyer: The SEC is the Best Conference This Year… in College Basketball. Kentucky is one of the three best teams in the country. Tennessee and Auburn are bona fide title contenders. LSU, Florida and Mississippi State will flirt with a top-25 ranking throughout the season. Even teams like Alabama and Vanderbilt will be tough outs game in and game out. The SEC used to be a punch line when it came to college hoops, but that’s no longer the case. Geary: The Big Ten sends more teams to the tournament than the Big 12, something that's happened only once in the last five seasons.